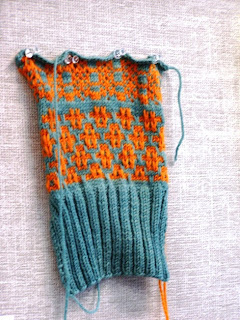 I have wanted to make a funky colored, color-work sweater vest for awhile now. So I created a swatch. Of course the colors are not quite accurate in the photo, but pretty close. The bottom pattern is a slip-stitch pattern, the top is a stranded color-work pattern. I have had this swatch pinned to the bulletin board in my new office in order to make sure I really do like the colors. They sorta border on the obnoxious, but I have not grown tired of them yet (they have been hanging here about 2 weeks now). I think I like the bottom pattern the best. I have started knitting the actual sweater vest, but have only gotten to the ribbing. I will start the color-work portion this evening, as we are driving down to visit the in-laws. I am a bit worried that I will not have enough yarn. But I am going for it anyway. I will post a picture after I have finished my weekend knitting.